Yes they work. By doing the course you reduce travel time that you would normally have every week at the start and end of each lesson, as you drive to and from your training area. It also eliminates a lot of recapping on subjects that many pupils require from one weekly lesson to the next. You will also be learning to drive in a much shorter time compared to doing weekly driving lessons, which can take from 6 months to a year. Intensive courses also save money in the long run compared to weekly lessons. Is an Intensive Course for you? The course is very intense and you will need to be like a sponge and absorb as much information as you possibly can, however it is only for one week. You will be required to be available Sunday to Friday, 9am to 5pm, based on doing a 30 hours Intensive Course. Therefore you will need to arrange your diary schedule so that you are free from School, College, University, Work and any other commitments. Working Night Shifts while attending the course is also not acceptable as you will find the course very tiring. You are paying a lot of money for your course, so you will want your course to be your main focus for that week. Also you are going to spend a lot of time with your instructor in a small confined space. So you want to be with someone you feel comfortable with and to help you make that decision you will get a chance to meet your instructor during your Assessment Drive. Which course is appropriate for you? Courses are moulded around each individual, and taught on a case by case basis. Below is a general guide to give you an idea on how many hours you may require. However, your Instructor will take you out for an Assessment Drive prior to booking your course and help you find the best course to suit your needs. 5 to 10 hours (1 to 2 days) - For learner drivers who have failed a practical test within the last month or two. 20 hours (3 days) - For learner driver's that have had 15 to 20 hours of lessons and have just got to grips with the manoeuvres. 24 hours (4 days) - For learner driver's that have had 10 to 15 hours of lessons and are just starting to learn the manoeuvres. 30 hours (5 days) - For learner drivers who have had little or no experience. Any unused Lessons are refunded back to you at the end of your course. Subject to a successful Practical Driving Test. Refresher Courses from 10 to 20 hours (2 to 3 days) - For qualified drivers who have not driven for a while and require lessons to gain their confidence and get back on the road. Courses can start from your home or any previously agreed location. All of the Intensive Courses provide the following:- 10 to 30 hours in-car training (which includes 2 hours for attending the driving test). A practical driving test fee is included the price of the course. The One Week Course (30hrs) is run over 5 days, with your Practical Driving Test on the next working day. Courses would usually start on a Sunday, so that you can have your test on Friday morning. Therefore doing 6 hours Sunday, Monday and Tuesday, 5 hours Wednesday and Thursday, with the final 2 hours used on the Friday for the practical test. This ensures you only have a warm up drive before your test and not a full day of lessons, which will ensure you're not too tired and therefore increase your chance of passing. Your day is made up of 1.5 hour lessons with a half hour break in the morning and afternoon, and an hour for lunch. Therefore your 6 hours day is from 9am to 5pm and 5 hours day is from 9am to 3:30pm. All pupils must have an assessment drive prior to starting their course, as an Intensive Course is not suitable for everyone. If you are not suitable and you have paid your deposit, then a full refund will be given, less the 1 hour assessment fee of £45. It is not essential that you have driven, but it can help if you've done a little bit before. If while progressing through the week, we feel you're not going to be ready for your test, then we can discuss the best solution at that time. This may be just changing your test to a later date. 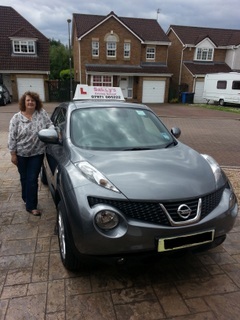 Your Instructor: My name is Sally Robinson, and I live in Livingston, West Lothian. I am able to cover the whole of West Lothian, using the Test Centre in Livingston. After 20 years of driving experience, I became a fully qualified Approved Driving Instructor (ADI) in September 2005. Initially trading under the Learner Driving Centre (LDC) before starting Sally's Driving School in July 2007. From the start of 2017 I've changed my business model to only focus on Intensive Courses and I am no longer taking on pupils for weekly lessons. The Car: I currently use a Nissan Juke Tekna 1.5 Diesel Manual, fitted with Dual Controls, Air Conditioning, Power Steering and both driver seat and steering column adjustment, which caters for various heights of pupils.